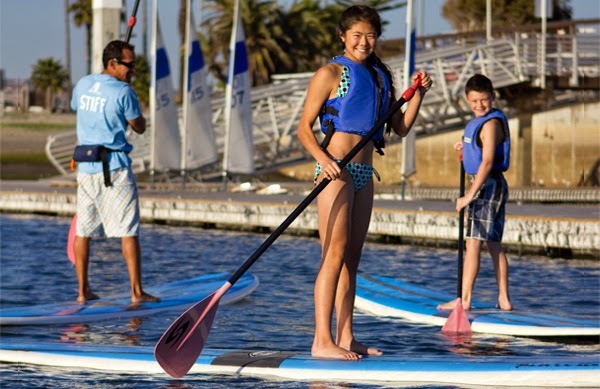 Mission Bay Aquatic Center Blog: SUP into Spring! Spring has sprung a little earlier than normal this year and there's no better way to spend these hot days than at The Watersports Camp for some fun on the water. On April 4th we invite you to cool off with some family fun at our SUP Into Spring- Youth and Family Paddle. The activity will begin with a brief skills session and orientation to stand up paddling before embarking on a tour around the coves of Mission Bay with our skilled instructors as your guides. The bay has been thriving with marine life, so make sure to keep your eyes open for seals, dolphins, and bat rays. This SUP Into Spring activity is scheduled from 2pm-5pm and is open to campers and their friends and family. No experience is necessary. The cost is $40/person and includes a board, paddling, and safety equipment. Deadline for registration is Thursday, April 2nd. Space is limited, so make sure to reserve your spot today at watersportscamp.com/off-season/.